There is just no better way to keep your cool tailgating, on a hunting or fishing trip, camping or just hanging with friends, than with a YETI Cooler. Founded by two brothers who grew up loving the outdoors, YETI Coolers had a simple mission: build the cooler that could take any abuse they put it through in the wild or on the water. YETI hard coolers, the Roadie and Tundra, are made through a process called biaxial roto molding. This processes involves layering polyethylene plastic resin, heating, and spinning it to get a seamless and nearly indestructible product designed to take years of (ab)use! To test this, a YETI Cooler was filled with food and submitted to the IGBC Grizzly test. 1,500 lbs of Grizzly Bear claws and jaws were unable to break into the YETI and the bear left hungry! Every YETI hard cooler features deep-freeze sealing gaskets, 2" to 2.5" of the highest quality insulation (other coolers come with 1" to 1.5"), and the YETI Guarantee that it will last many, many years. The YETI soft cooler, the Hopper, is 100% leak proof and easily transportable. They are a bit smaller than their hard coolers and designed to fit any size adventure. They are made with a high-density fabric that is waterproof and puncture proof. Their Cold Cell insulation offers superior temperature holding and makes the coolers buoyant. The impressive Hydrolok zipper was inspired by cold-water survival suits and make the cooler completely watertight. 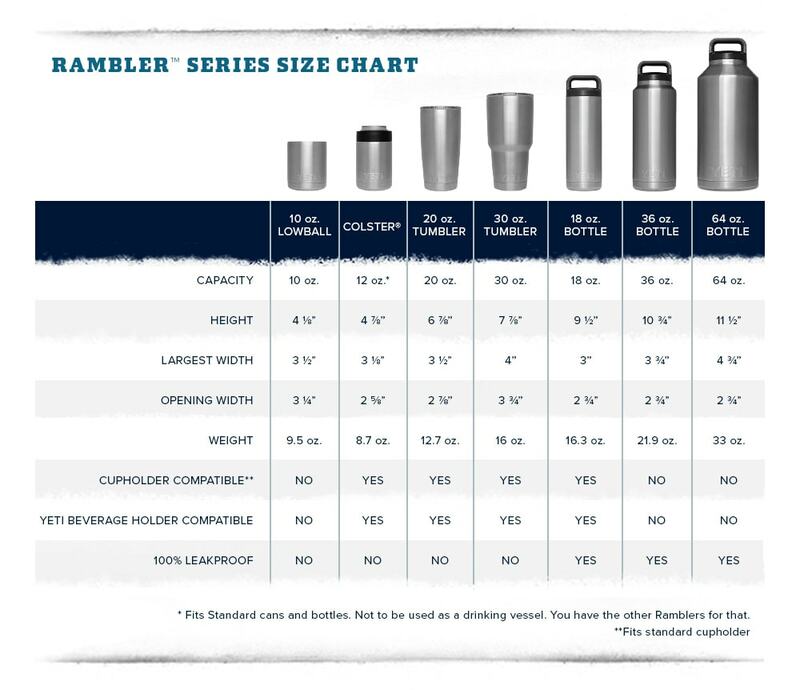 All YETI Rambler Drinkware are all made of 18/8 stainless steel and has vacuum-insulated walls that maintain temperature without transferring them to the outside, eliminating condensation and keeping your hands dry. Unlike cheaper alternates, they leave no lingering metallic taste and can withstand outside temperatures higher than others (over 160F and still keeps your drink cold). The lids are made from BPA free plastic and every part is dishwasher safe. When shopping for a premium cooler you have a few choices - You can go with the leader or one of the knock-offs, and while you might save a few bucks, the YETI quality is far superior, will outlast any competitor. They were the FIRST to push the cooler past its limits; and they have no plans to stop any time soon. YETI is wildly stronger and keeps ice cold longer. Some of our favorites at OutlandUSA.com are the YETI 20 oz Rambler Tumbler and the Tundra 45 Cooler. YETI Coolers make the ultimate Grizzly Bear proof containers for your next adventure in the wild. For this Grizzly test, the YETI Tundra was filled with food and submitted to 1,500 lbs of Grizzly Bear claws and jaws. The bear was left hungry, and now all YETI hard coolers bear the IGBC certification seal. Q: How long will my Tundra Cooler hold ice? There are many variables that will affect ice retention, so this is a difficult question for us to answer. Variables that can affect ice retention include the ice quality, ice quantity, type of ice (crushed, block, cube, dry), outside environment, exposure to direct sunlight, etc. Which is to say there is a lot you can do to affect the longevity of your ice. Because of the large number of variables, as well as the lack of an industry standard for measuring ice retention, claims that place a definite time (5, 10, 14 days) are often based on testing conditions and not real-life situations. The Tundra offers up to 3 inches of polyurethane foam insulation combined with a freezer-style sealing gasket. Beyond that, everything else is out of our control. But if you can minimize the negative variables that affect ice retention, YETI coolers can't be beat. See more about ice retention in our other FAQs below! Q: How can I replace the T-latches on my Tundra Cooler? Call YETI at 1-512-394-9384 to order new T-Latches then watch this video to easily replace them. Q: Can I keep hot items in my YETI? YES. The same thick walls and insulation that keep YETI coolers cold work just as well at insulating hot goods. Q: How to I maximize ice retention? There a lot of ways to keep the ice in your YETI hard cooler, soft cooler, or Rambler colder, longer. 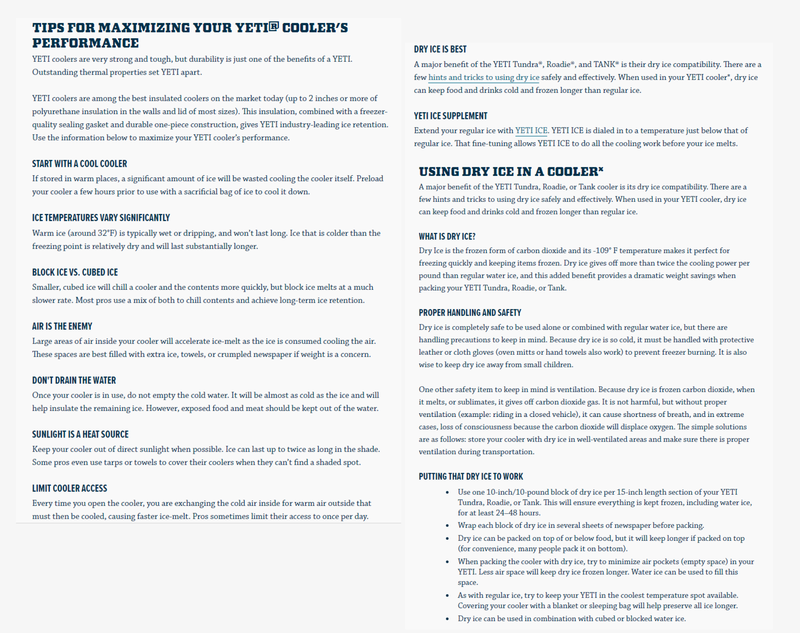 YETI has put together an awesome Ice Retention Guide with tips and tricks. Q: How do I clean my Hopper? A mixture of dish soap and water can be used to clean the outside of mud and dirt! This mixture can also be used inside if your Hopper smells a little funky. After each use, rinse with water and then thoroughly wipe the inside dry with a cloth or paper towel. Leave the HydroLok Zipper open for several days to ensure all moisture has dried. 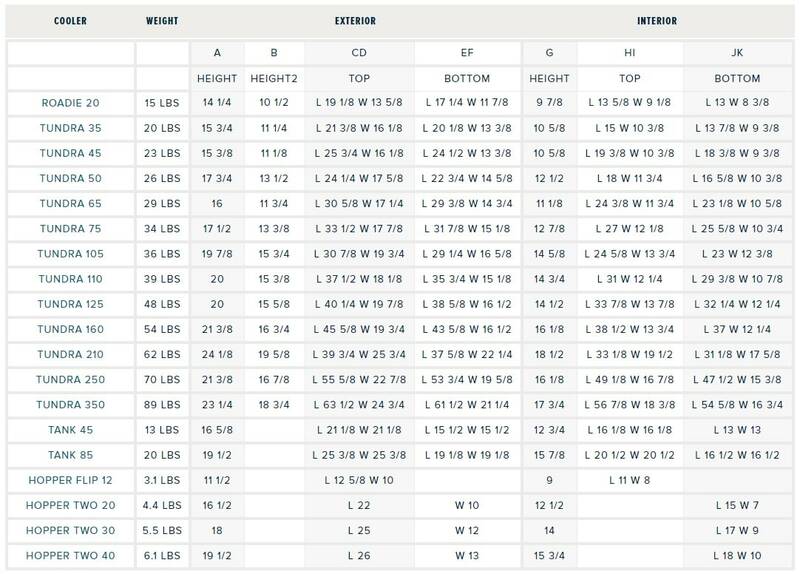 Taking care of your HydroLok Zipper is also extremely important. Each Hopper comes with a small tube of lubricant for your zipper. Apply this lubricant following cleaning, before storage, and anytime the zipper feels stiff. To preserve the HydroLok Zipper, make sure it is always free of dirt, grim, or other debris for maximum performance! DO NOT machine wash your Hopper EVER. DO NOT dry in an oven or clothes dryer. Q: What does the IGBC "Grizzly- Resistant" seal on my YETI mean? YETI hard-sided coolers were tested by the Interagency Grizzly Bear Committee (IGBC), a U.S. Forest Service Department of Agriculture Committee that works in both controlled and wild settings with grizzly bears. They publish minimum design and structural standards, inspection and testing methodology for bear-resistant containers. In other words, the YETI Tundra met the IGBC requirement for both engineered and live bear tests. The Tundra was filled with food and submitted to 1,500 lbs of Grizzly claws and jaws. The bear was left hungry, hence why YETI coolers bear the IGBC certification seal. Q: How do I clean my YETI Rambler? 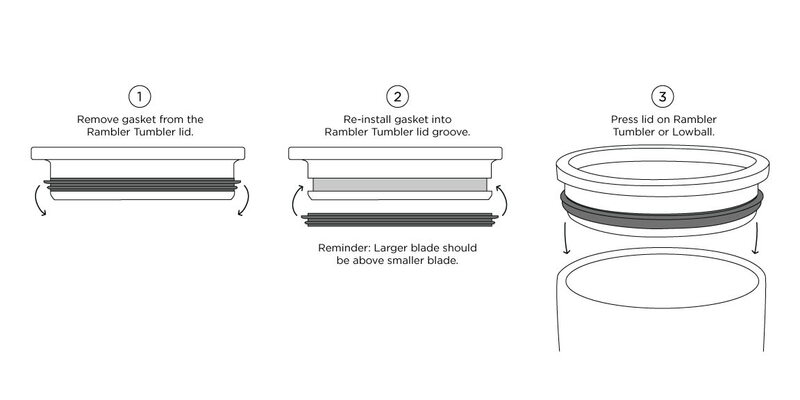 The Rambler Tumblers and Bottles are all dishwasher-safe, but be sure to remove the lid before placing it in the dishwasher. Feel free to keep it old school and clean your Rambler with dish soap and warm water anytime. YETI recommends NOT using bleach or abrasive cleaners. 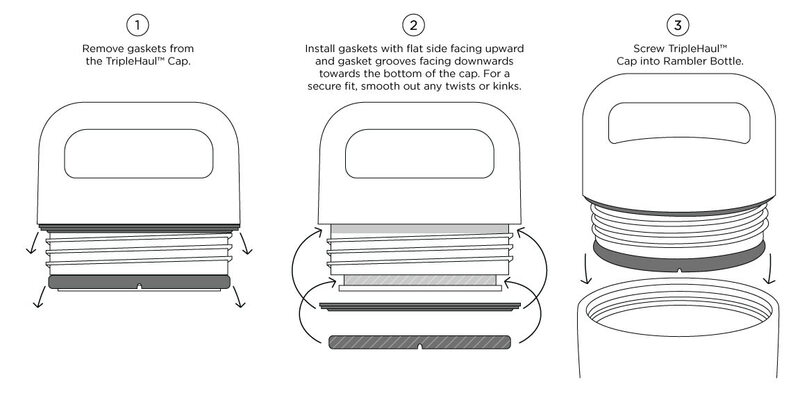 For a more thorough clean, remove gaskets, wash, and dry separately before reinstalling. See gasket removal photos below to deep clean your Ramblers and Bottles! YETI is dedicated to making the most durable coolers and drinkware on the planet. Sometimes the unexpected happens, so if anything is wrong with your YETI product, let us know! We will work to make it right. Any product(s) damaged in shipping (when ordered from OutlandUSA) or defective product(s) must be returned directly to OutlandUSA in the original box or adequate cardboard packaging. Call our customer care line at 615-776-8824 for more information. To submit a warranty claim on one of your YETI products, contact them at 1-512-394-9384. You will need to fill out a Warranty form and get a Return Authorization Number (RMA#) before you send back your YETI product. For more information about what is covered in the YETI Warranty, read on! YETI Tundras, TANKs, Roadies, YETI ICE, and the YETI Rambler Series of stainless steel products carry a 5-Year Limited Warranty against defects in material and workmanship. This warranty applies to only the original owner and is void if the product is used commercially, structurally altered, or subjected to stress beyond the physical limits of the materials used in body or components, or is damaged as a result of abnormal use. Normal wear and tear is not warranted. Any limited edition cooler still under warranty will be replaced at the discretion of YETI with the same size cooler in a different color based on availability. YETI Hopper carries a 3-Year Limited Warranty against defects in material and workmanship. This warranty applies to only the original owner and is void if the product is used commercially, structurally altered, or subjected to stress beyond the physical limits of the materials used in body or components, or is damaged as a result of abnormal use. Punctures and normal wear and tear are not warranted. DISCLAIMER: This warranty does not include any manufacturer responsibility for any incidental or consequential damages resulting from the use of the cooler. If warranty applies, the manufacturer will repair or replace, at their discretion, the cooler or any part or component that is deemed defective. YETI reserves the right to change products and designs without incurring any obligations to incorporate such changes into already completed products, or those in the hands of dealers or consumers. Products repaired or replaced under this warranty may or may not incorporate these changes. 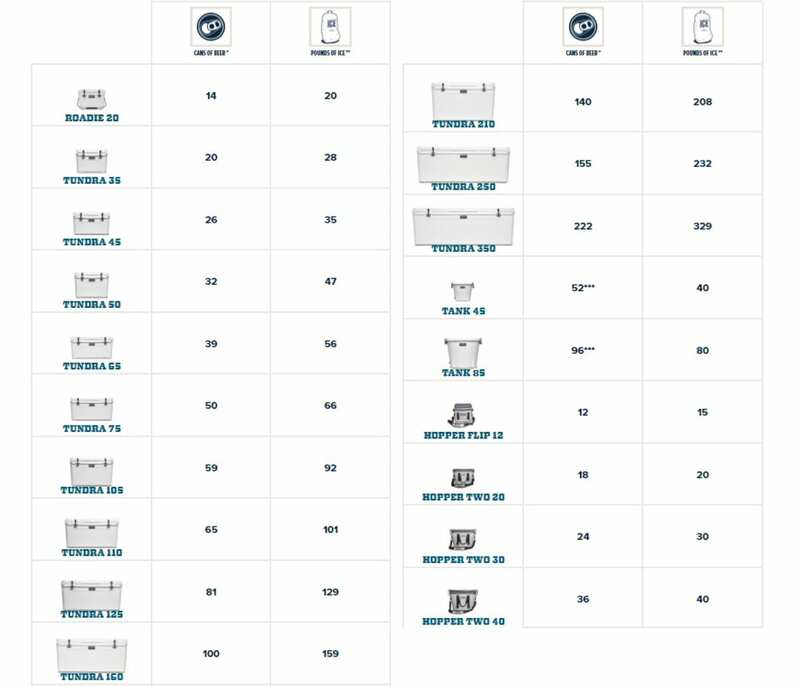 Check out the YETI sizing charts below to ensure you're getting exactly what you need out of your YETI Cooler, Bottle, or Rambler.